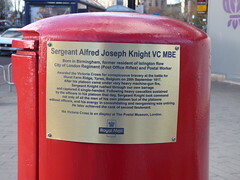 Alfred Joseph Knight, VC, MBE (24 August 1888 – 4 December 1960) was an English recipient of the Victoria Cross, the highest and most prestigious award for gallantry in the face of the enemy that can be awarded to British and Commonwealth forces. He was the only Post Office Rifleman ever to receive this award. Sergeant Alfred Joseph Knight VC MBE Born in Birmingham former resident of Islington Row City of London Regiment (Post Office Rifles) and Postal Worker Awarded the Victoria Cross for conspicuous bravery at the battle for Wurst Farm Ridge, Ypres, Belgium on 20th September 1917. Aftert his platoon came under very heavy machine-gun fire, Sergeant Knight rushed through our own barrage and captured it single-handed. Following heavy casualyies sustained by the officers in his platoon that day, Sergeant Knight took command not only of all his men of his own platoon but of the platoons without officers, and his energy in consolidating and reorganising was untiring. He later achieved the rank of second lieutenant. His Victoria Cross is on display at The Postal Museum, London.